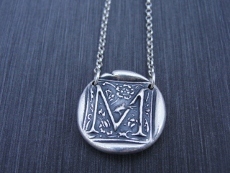 Our rustic wax seal initial pendant is made from .999 FINE SILVER. The pendant is approximately ¾” round. 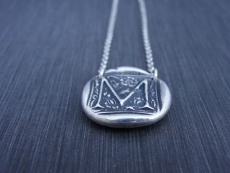 The pendants are handmade of fine silver with wax seal stamps then oxidized (blackened) for an antique finish. The chain is a sterling silver rolo chain and comes in three different lengths, 16”, 18” and 20”. Each piece is unique and has the look of a thick hand stamped wax seal. Fine silver is a slightly higher grade than sterling silver and will not tarnish.